This is bad! All the roof around the transept (centre of the cross) is in flames and I don't think it can be easily extinguished! Couldn't resist the firefighter joke, sorry. All joking aside, that is truly a tragedy to see this happen to such a historic structure. I hope all the occupants are safe and the firefighters can stay safe as well. Fires like that are extremely difficult and dangerous to fight, as old (and very tall) buildings are notorious for killing firefighters due to collapses. Awful news, no doubt it'll be repaired - we've had similar such fires to historic buildings in the UK - but you do wonder how the fire could have started. There was maintenance or restauration work at the spot where the fire started but it is too early to know what happened yet. Basically all the wood roofing is gone now (after 2hours) and and what worries me is the intense heat could certainly have damaged all the stone vaults making repairs very long and complex. I don't doubt repairs can be made and it will be done but it is a sad day for sure. All of those artifacts will be impossible to replace. Hopefully the shell survives, so they can at least rebuild. The cathedral that stood for 800 years may be brought down by a spark from a tool. Tragic and terrible. The Glasgow School of Art was close to finishing being renovated after a fire, when a much larger one broke out, it seems like restoration work brings very serious hazards. A very sad day, especially for Paris. I am watching live on CNN and am sick to my stomach. Surely has to be related to the renovation work going on. There is quite a lot of scaffolding up. I'd be shocked if that is not the cause of this. So sad to see. We studied that church in architecture school. That old wood no doubt went up like kindling. We were doing concrete work for a condo in Portland that was wood structure over concrete base(our work). After hours a homeless guy came in and started a campfire that got out of control and engulfed the whole wooden structure. Got so hot it popped off top 1" of concrete and discolored and scorched the buildings across the street on all four sides. 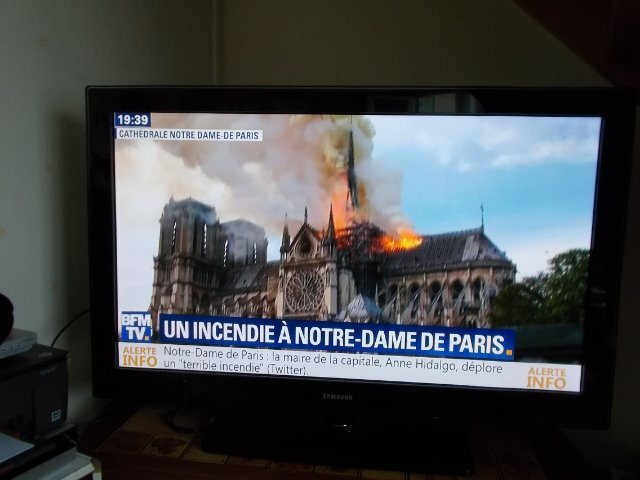 I only hope the Notre Dame fire doesn't damage all the structure around to the point it cant be rebuilt. As expensive as it will be, I am sure that as loved as that church is, they will be able to raise the money to do it. I hope we see a very smartly engineered, high profile fundraising effort for the rebuilding. I'd be shocked if people from all over the world don't donate all they need and more to rebuild her. Very, very sad. I was lucky enough to visit the place 12 months ago and to appreciate the grander of such structures. It will undoubtedly be repaired and it will cost a fortune and it will take a long time but it will be done. The poor firemen had really no hope with a structure so large. So may ancient buildings are at risk and, sadly, it is usually the act of a workman that starts it all off. Very few places like this have any kind of proper fire protection. President Macron just confirmed that it will be rebuilt. That effort starts tomorrow. The main facade and 2 bell towers are also saved and structurally intact (at least it sounds that way). They are also reporting now that many works of art have been salvaged and removed from the church before they were consumed by the flames. They say that the structure is safe now and shouldn't collapse.